Passed down to me from my mother, this traditional Bengali dish -- known more commonly in the Bengali community as macher jhol -- is a simple sauteed fish in a spiced water-based gravy. 1. 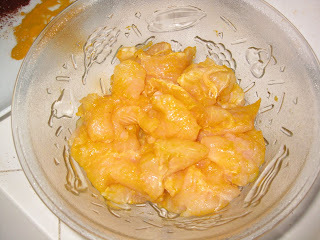 Sprinkle the fish pieces with 1/2 tsp. of the turmeric and 1 tsp. of the salt. Mix these three items together well, then let the mixture sit in your fridge for about 30 minutes before using. 2. (Optional) While the fish is blending with the spices, cook your rice. (Brown rice usually takes about 30-40 minutes, so mine was done before I started cooking the fish.) Fluff the rice with a fork, then cover until ready to eat. 3. Pour enough canola oil into the skillet as to coat the bottom. 4. 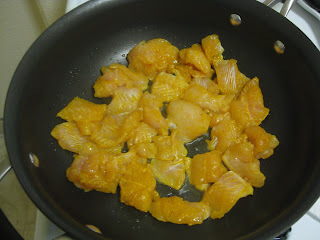 Add the fish to the skillet and saute on medium heat, stirring occasionally, until just cooked. (If you're not using a non-stick skillet, my mom recommends coating the fish pieces in a little all-purpose flour to keep them from sticking.) Remove the fish from the skillet, place on a plate or tray, and cover with aluminum foil to keep warm. 5. Add the onion and saute on medium heat for about three minutes. 6. 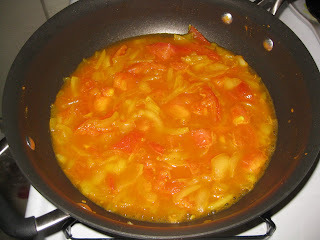 Add the tomatoes, the remaining 1/2 tsp. of turmeric, and 1/2 tsp. 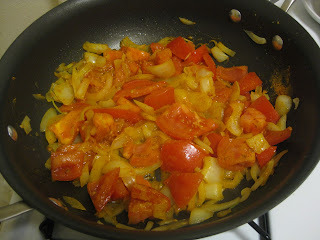 chili powder (or more, to taste), to the skillet, and saute on low heat for about 3 minutes. 7. Add 1 cup of water and the remaining 1/2 tsp. of salt and increase the heat to high. When it starts boiling, lower the flame, then add the fish back into the skillet. Simmer for about 3 minutes. 8. Turn off the flame. Garnish with cilantro. 9. 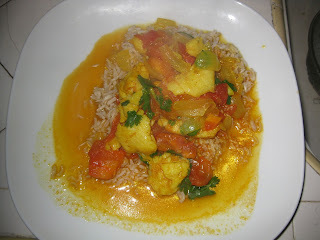 (Optional) Serve over a bed of brown basmati rice. The AHH Factor: This fish preparation has been passed down in Bengali families for generations. This month, however, marks my first attempt at making it. Macher jhol, literally "fish in gravy," is a dish my mom has in her regular dinner rotation, and this is one variation of her many ways of making it. My mom seemed to take my asking for the recipe as a "teachable moment," as she's spent the past several weeks lecturing me about how I spent way too much money on the ingredients. Apparently, I was supposed to go to an Indian grocery store to buy the spices and to an Asian-focused farmers' market for the fish. Still, I think she was secretly happy that I asked for her recipe, and I'm secretly happy that it turned out well -- though we'll never admit that to each other. Swai is a Vietnamese catfish, which is marketed as "swai" because it can't legally be called "catfish" in the U.S. (U.S. farmed catfish producers were concerned it would take a bite out of their market.) But regular catfish works too (though I wasn't able to find it at my local grocery stores; I think my mom has an easier time in Georgia), as does tilapia if you can't find either. What's your favorite fish recipe? What suggested tweaks do you have for this one? Loved the recipe...I will definitely get around to trying it out! If you have any good recipes for grilled marinated Mahi mahi please post them! Thanks! And Vandana -- I will work on a mahi mahi dish for you! After looking in the fridge and only finding swai and Turmeric I turned to Google. I gotta say this is the best dish I've had in a long time. #ILoveBengaliFood! when cooked with turmeric and olive oil, should it turn red like blood ? 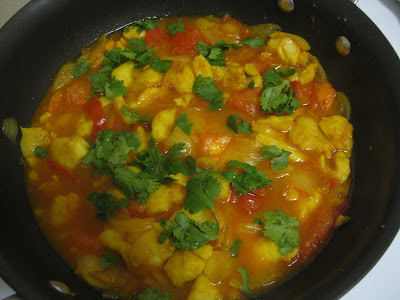 Cooking Swai while I Am first time in US..just Loved this recipe.